JivoChat is easy to install, offering integrations for many content management systems such as WordPress and Wix. 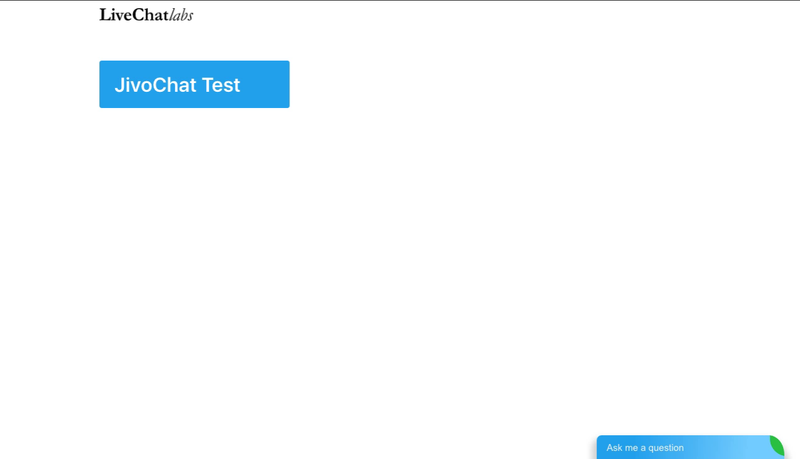 I really liked the live preview on your website which you get when customising the live chat widget. After installing the widget, I did however find it hard to locate various settings in the admin area. This was exacerbated by an inconsistent user interface design in the admin area: whilst many screens maintain the admin navigation and sidebar context (as I would expect), some actions open screens in a new browser tab and yet other actions open a modal window and hide the admin navigation context. One thing which makes JivoChat stand out from its competitors is its integration of VoIP PBX features. For example, it's possible to purchase phone numbers for your business and forward these to mobile phones or configure SIP phones so that your team is available by phone as well as live chat. They also offer a good callback feature which lets your website visitors enter their phone number to be called back by one of your team members. JivoChat offers a now fairly standard 3 panel layout: your current chats are shown on the left, the current chat is in the middle and contextual information for the chat on the right. JivoChat is available for free, for up to 5 agents. Unsurprisingly, the free version has some limitations (see the feature list below). 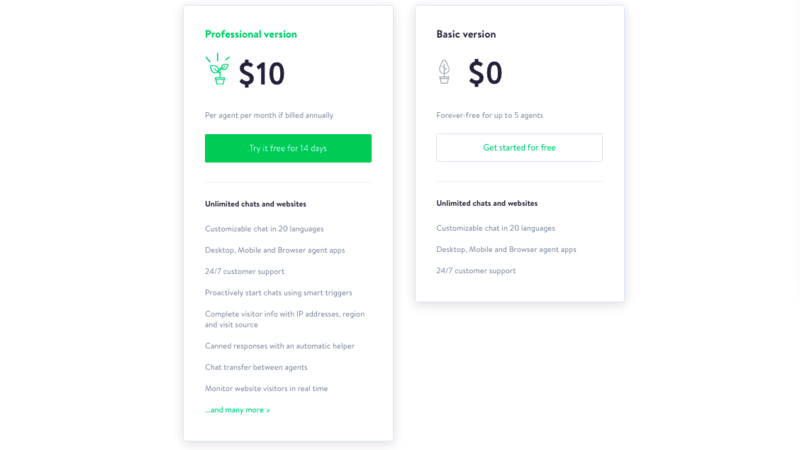 If you need any of these features, you can upgrade to the Professional version at $10 per user (with annual billing). You can route chats based on the visitor's choice of team (department) or based on the visitor's location (via the Regions feature which uses geo IP data). JivoChat lets you save replies (also known as 'canned responses') for quickly answering frequently asked questions. You can ban unwanted visitors. You can hide the chat widget when all agents are offline. Unfortunately, no further customisation (e.g. 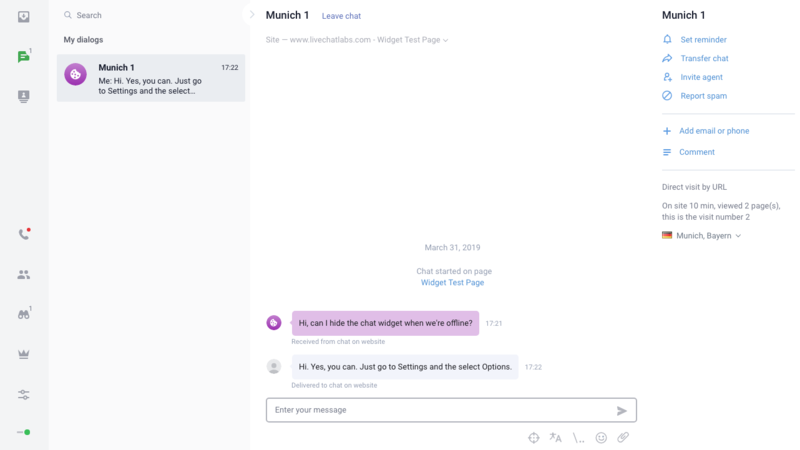 hiding the chat widget on certain pages) is not supported. You can trigger chats with visitors based on rules which you can set up. The free version provides a daily performance email and a working time chart for agents. The paid ('Professional' plan) adds real-time visitor monitoring, service quality ratings by customers, a google analytics integration and the ability to export reports to excel. You can receive emails into JivoChat by adding an email channel. You get an email address like company@jivo-mail.com which you can then forward emails to. Complete visitor info with IP addresses, region and visit source. JivoChat offers automatic translation from English, Russian, Portuguese, Spanish, Turkish and Bahasa to any language supported by Google Translate. JivoChat offers apps for iOS (tested and it's very good), Android, Windows and Mac.